This year is the year of me. 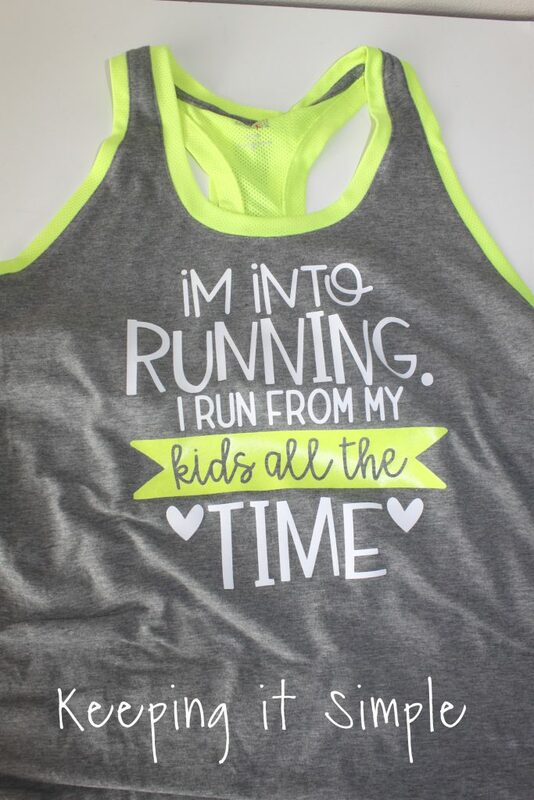 This is the first year in 13.5 years that I all of my kids are in school, so I am taking the year and I am focusing on myself. 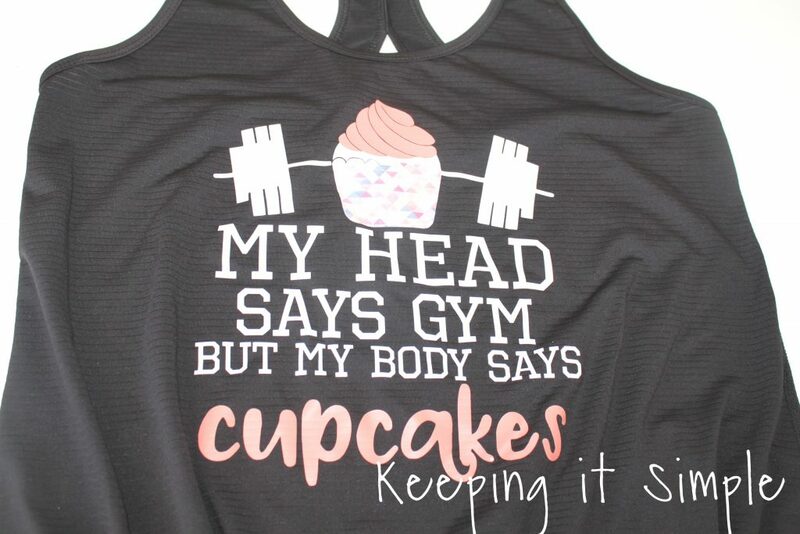 That means that I am working out more and trying hard to get healthy and happy. 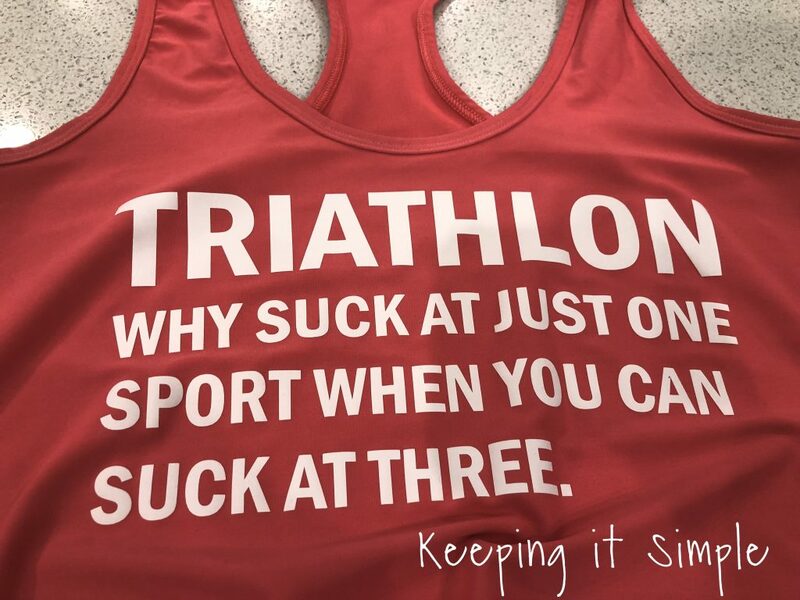 For all who work out, some days it is really hard to get the gym, whether it be lack of motivation or you get too busy, some times it is hard to work out. 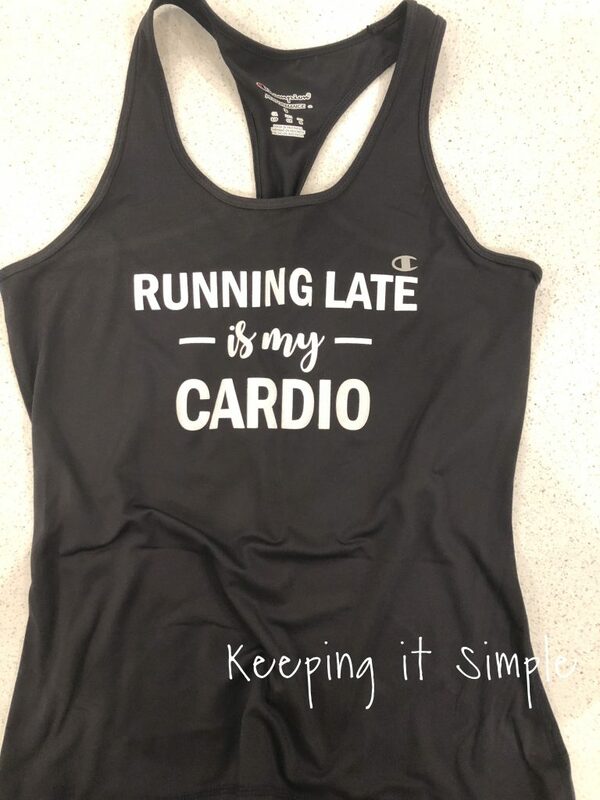 One thing that I have found that works for me is getting new workout clothes. Seriously. It’s funny how getting something new gets me excited and makes me want to do something. 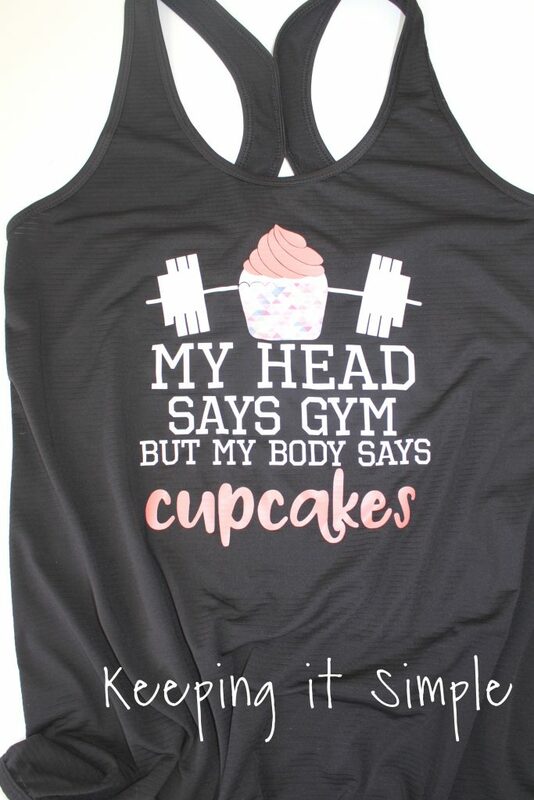 Well since I have needed a lot of motivation over the years, I have a LOT of fitness shirts and workout tanks. So instead of buying more, I found that me just putting a funny design on them gets me just as excited! 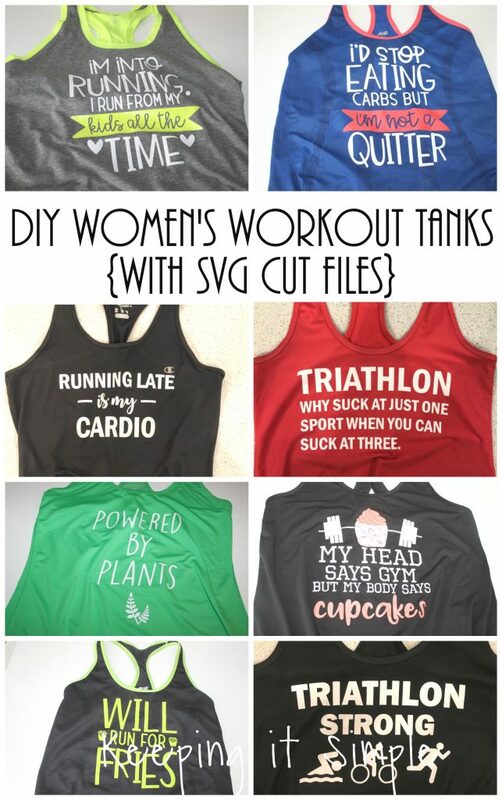 So I took a lot of my workout tanks and added to them. 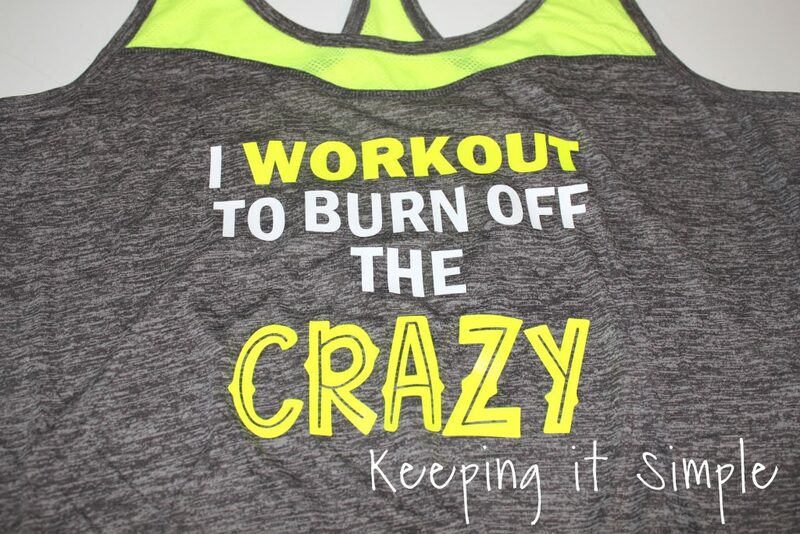 I love how these turn out and it’s so fun to have a funny shirt while working out! 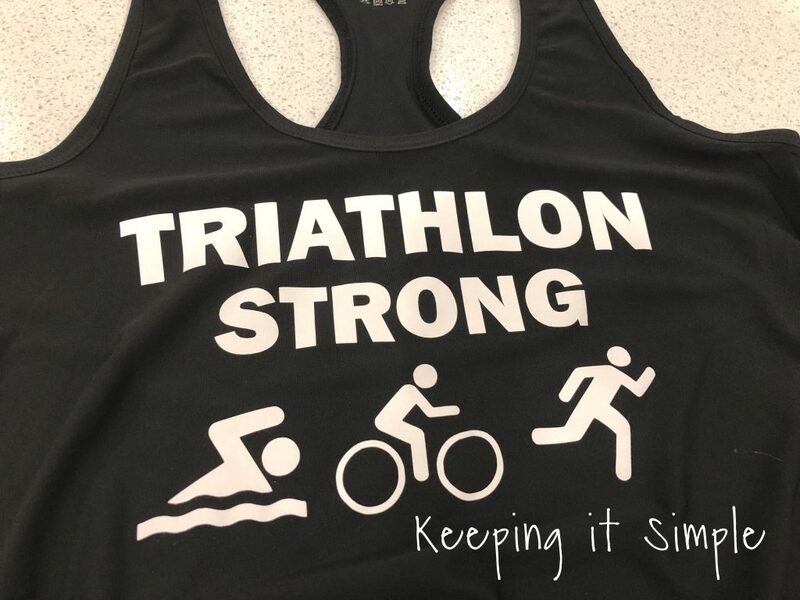 Before I get to the all the fitness shirts and SVG cut files, I wanted to show you a quick video to show how I make these. 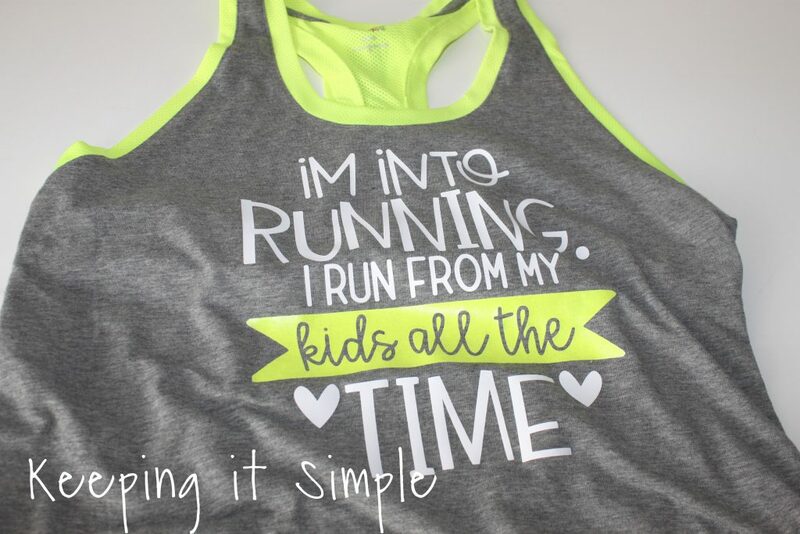 This is a video of boys shirt but it’s the same process of how I make these workout tanks. 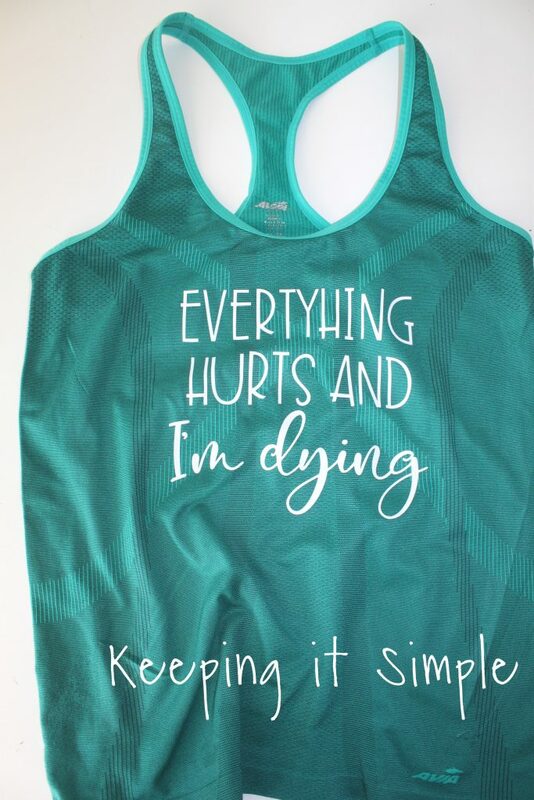 One thing that I do have to mention is that when you work with the heat press and tank tops, you have to put the tank around the base of the heat press because of the straps, you can’t get a good seal with you press it and you just put it onto the heat press. 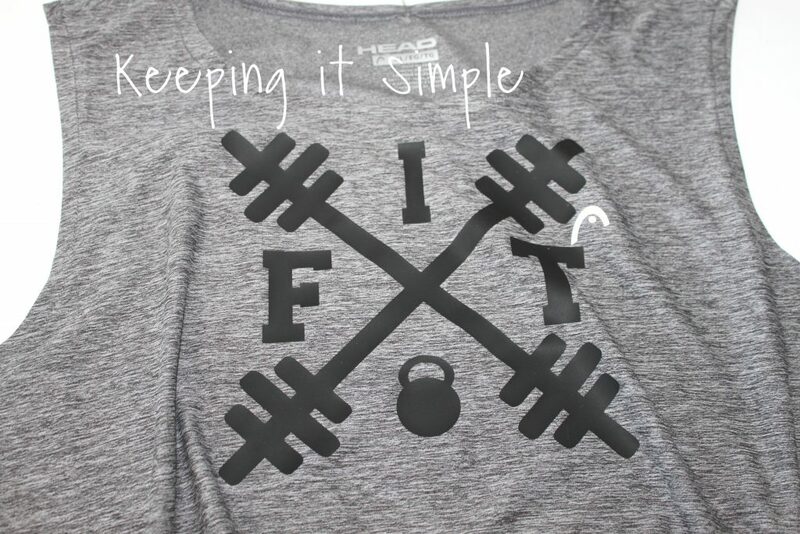 For all of these designs, I used my Silhouette CAMEO and then heat transfer vinyl. 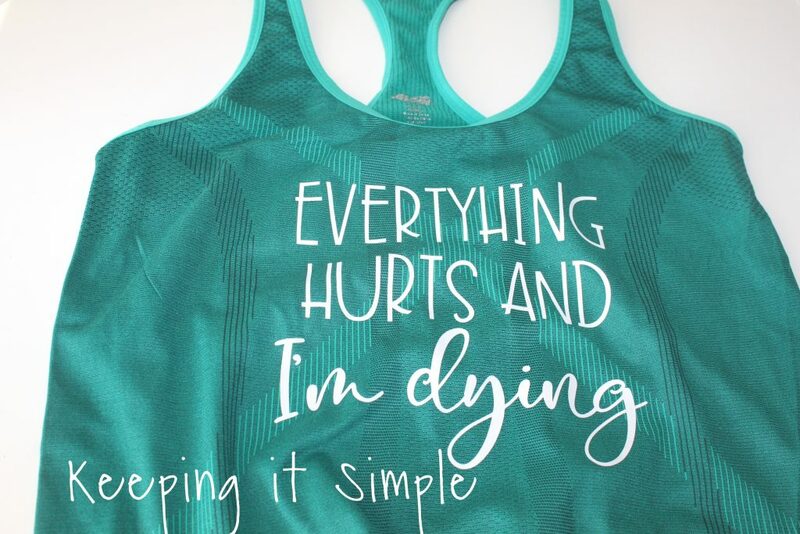 My favorite kind of heat transfer vinyl to use for these shirts is the stretch heat transfer because it has a little give to it and makes it nice that is stretches with you. When cutting HTV, you have to mirror the image and place the shiny/plastic side down on the mat before cutting. Most of the designs are about 8-9 inches wide. 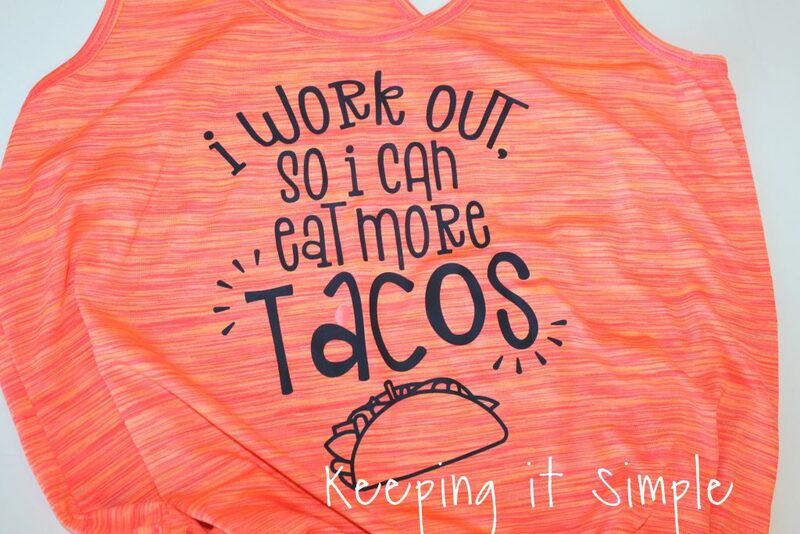 Also I get my fitness clothes and workout tanks all over the place. My favorite places to get them are Walmart, Ross and TJ Maxx. Let’s get to it! 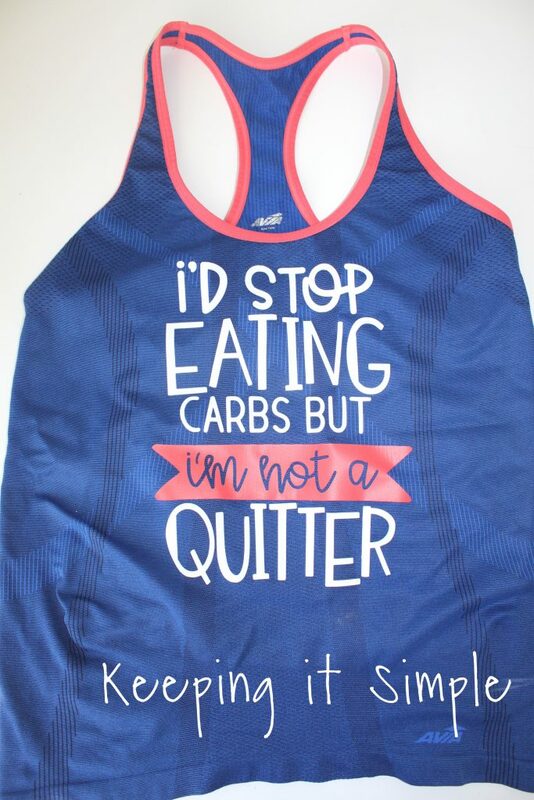 Most of these workout tanks are pretty funny but you could easily do some motivational ones or positive ones too! 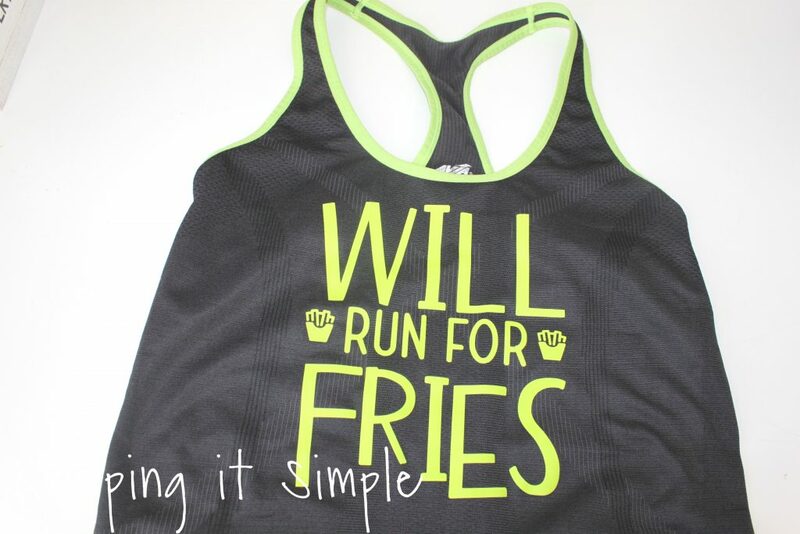 Also as you can tell by these tanks, I definitely love food! 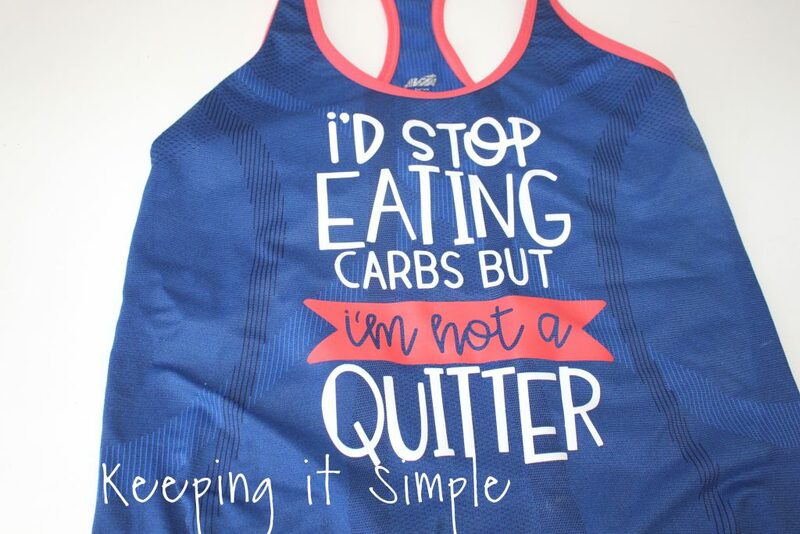 For this tank I wanted to have the cupcake wrapper in a fun design, so I used a patterned HTV called Coral Triangles. I love how it looks! 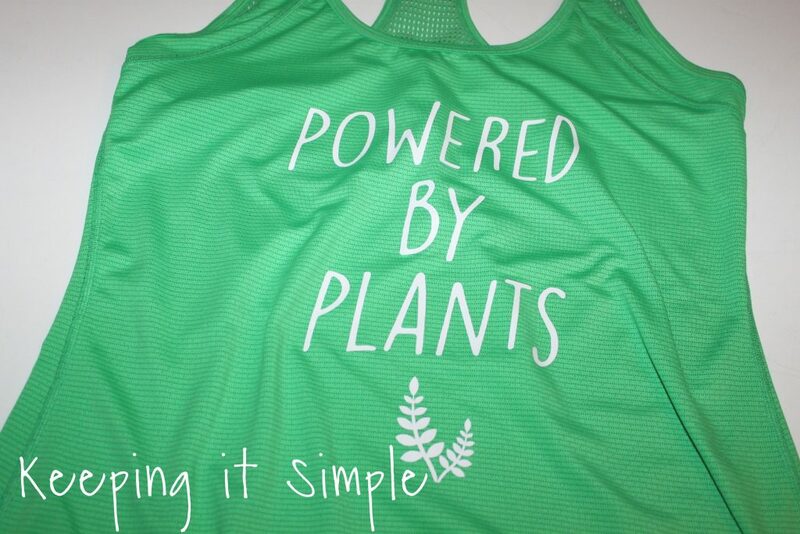 Then I used a white stretch heat transfer and a regular easyweed heat transfer in the color melon. For this tank I used a lime stretch HTV. 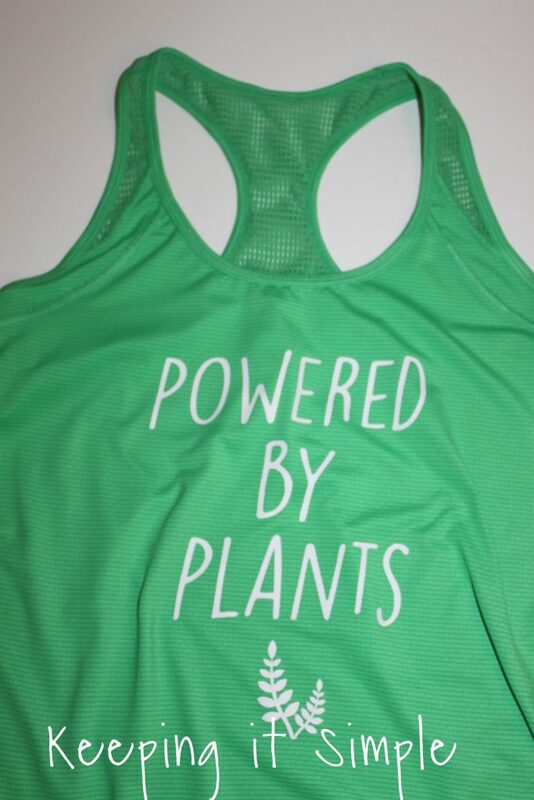 For the words I used a white stretch heat transfer and then for the tag I wanted to use a HTV that matched the trim of the tank top, so I used an easyweed heat transfer in the color hibiscus. For this one I just did a simple white stretch heat transfer. 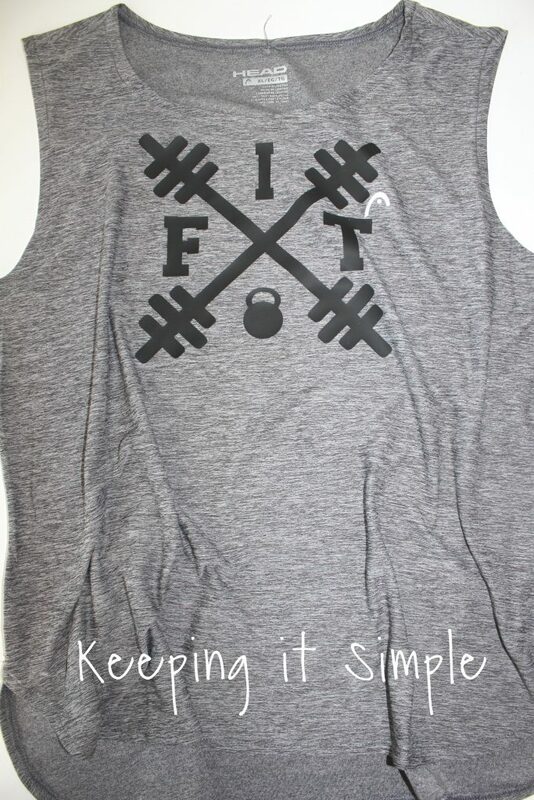 For this one I just did the white stretch HTV, can you tell that’s my favorite on fitness shirts?! My sister love glitz and glam, so we used a pretty white glitter HTV. Here is a close up this one, it’s super fun and I love the white stretch HTV on the black tank top. Once again I used the white stretch HTV. 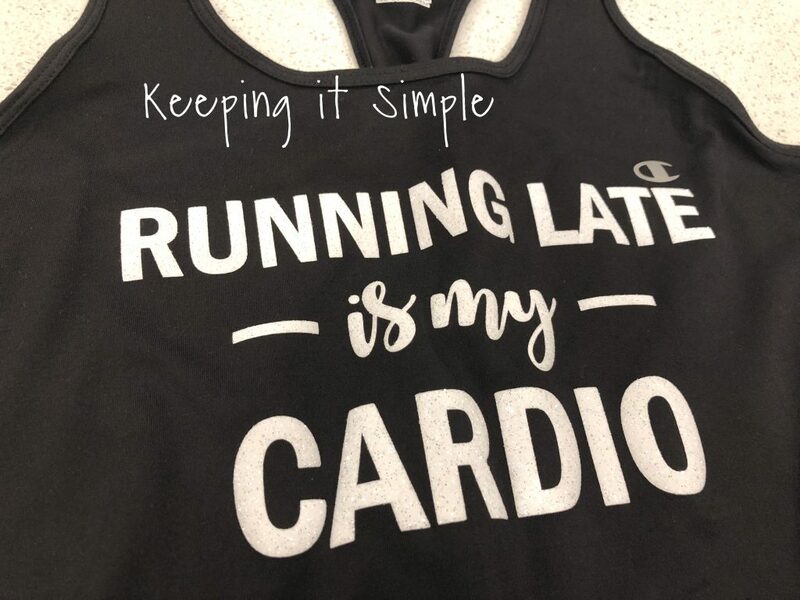 Clearly I love this one and if you ever plan on making shirts, you need it! 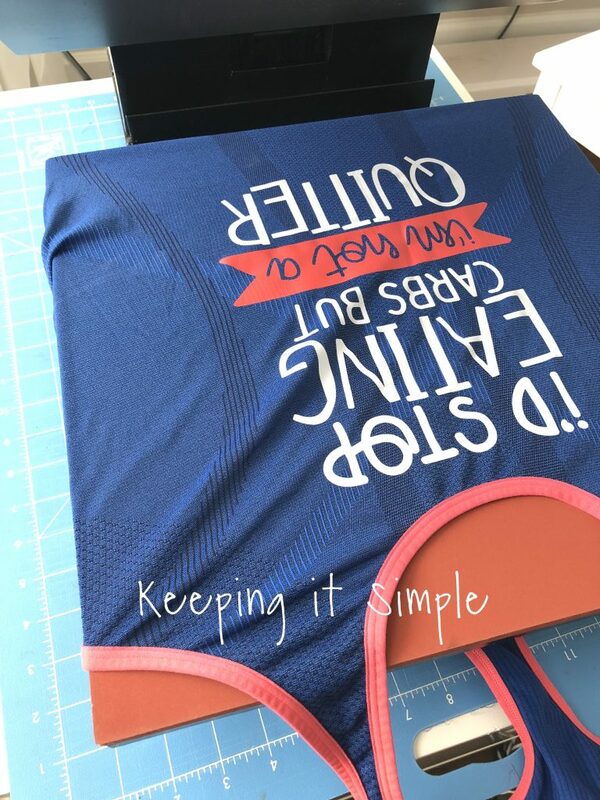 For this one I used a navy stretch heat transfer (the stretch has a lot more give than the regular smooth). Have you noticed yet that I like colorful clothes? 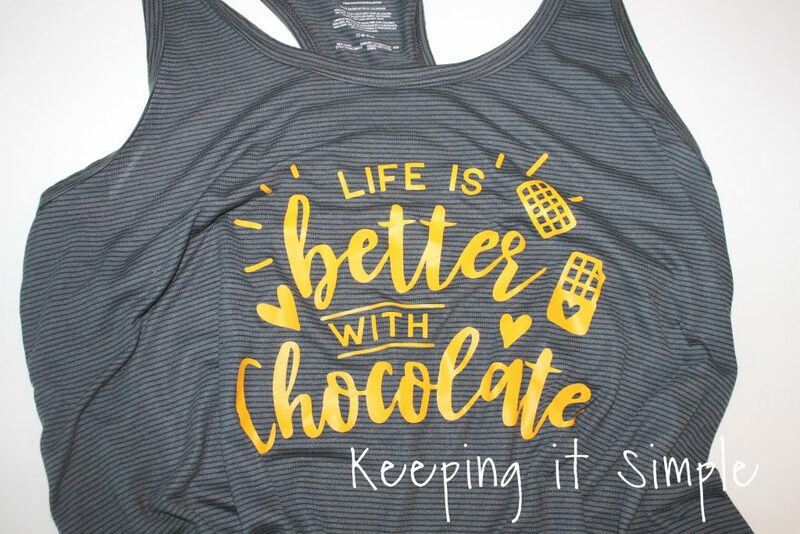 I couldn’t just put some boring color on this gray tank, I decided to go with the pretty yellow heat transfer! For this one I just used the white stretch heat transfer. 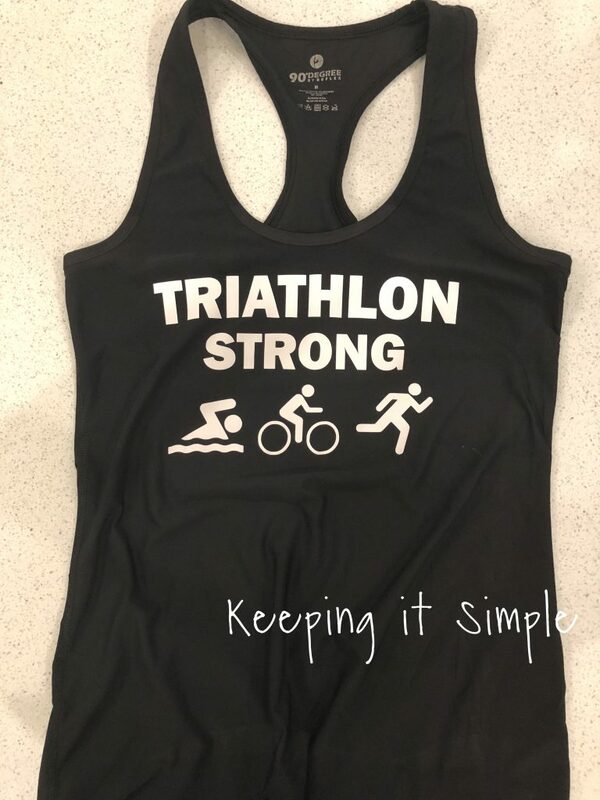 For this one, I used a white stretch heat transfer vinyl and then a neon yellow HTV and why yes they do have neon colors and they are amazing! 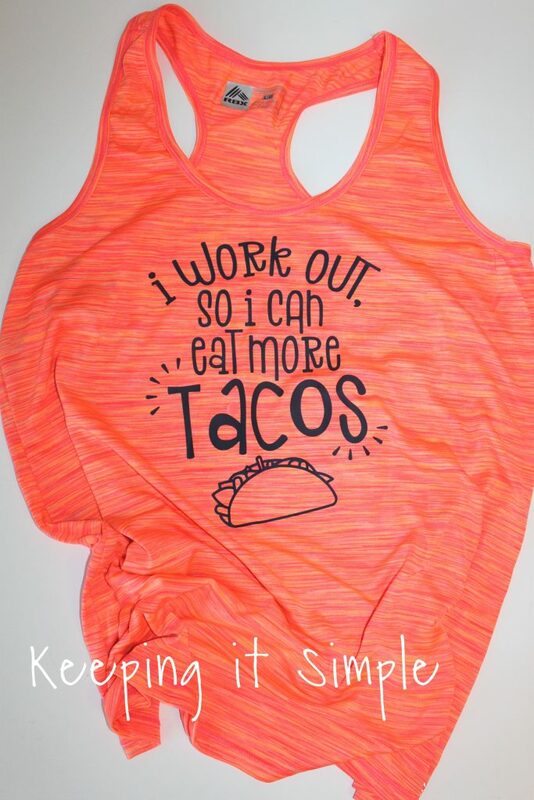 Workout tanks are super fun to make (can you tell that I love making them!). 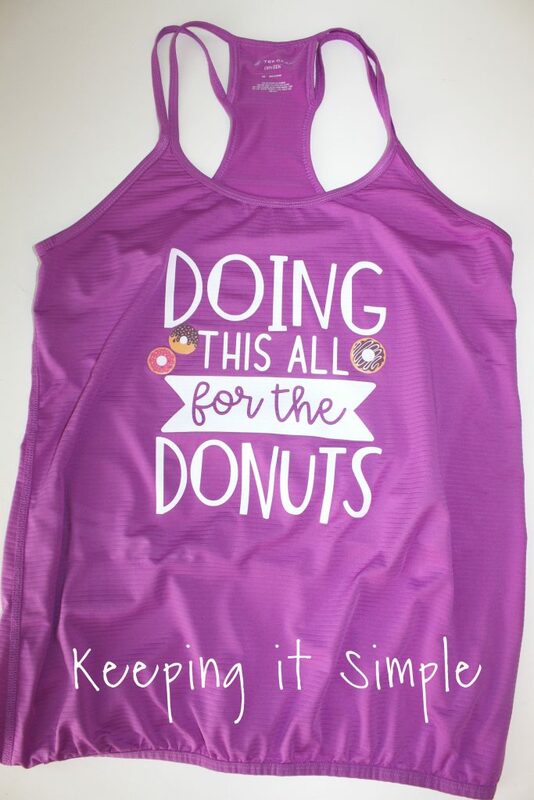 This donut one is perfect because I love sweets and donuts! 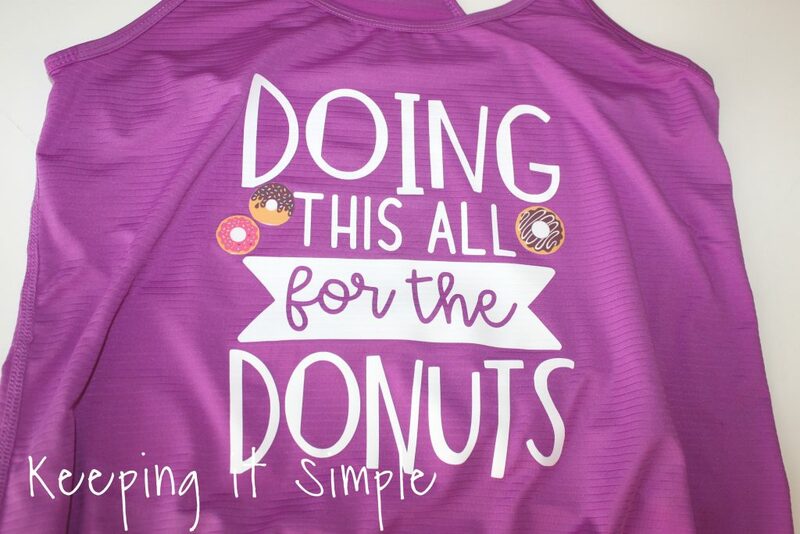 For this one I used a white stretch heat transfer and then a patterned donut vinyl, I just cut out the donuts with scissors. 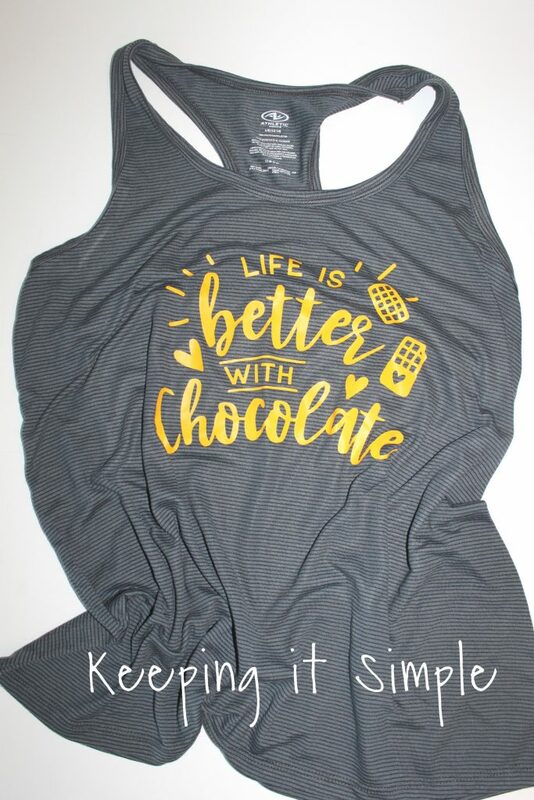 For this tank top I used deco foil and it has a different technique to put on, so check out this tutorial on how to do it here. 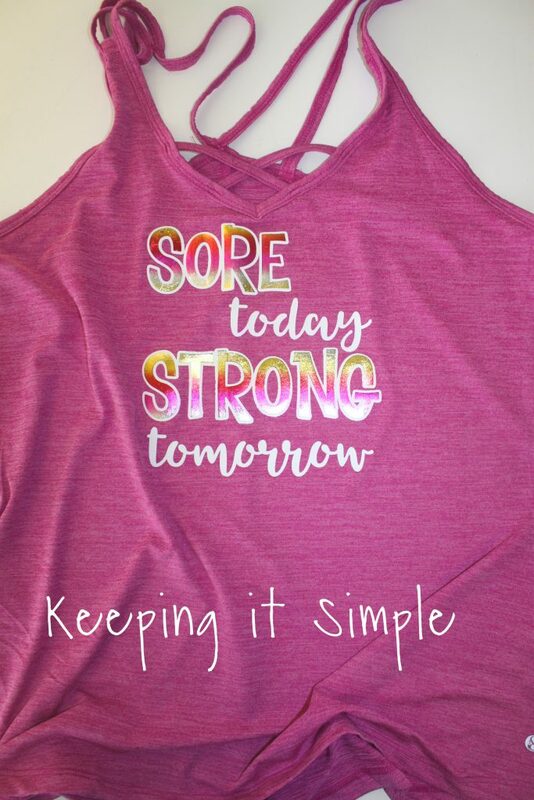 Since there is layering in this shirt, I first cut out the whole design in a white stretch HTV and then cut the words sore and strong out of an adhesive HTV. 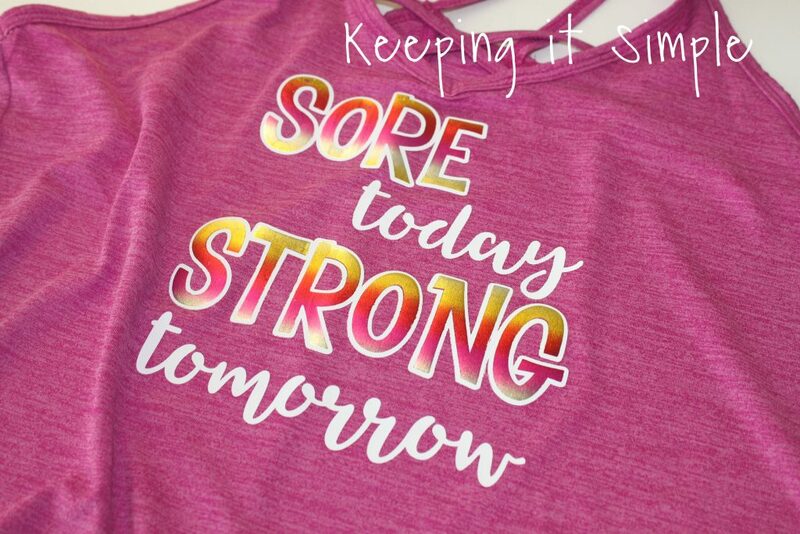 The white HTV I cut out for the words sore and strong are just the outline, I removed the actually words so that the foil could be pressed directly onto the shirt. 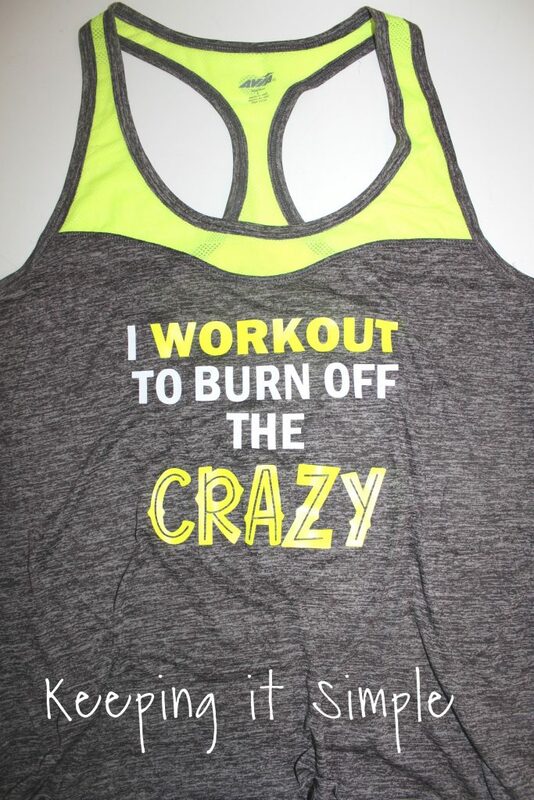 For this workout tank I used stretch HTV in white and then the florescent HTV in yellow. 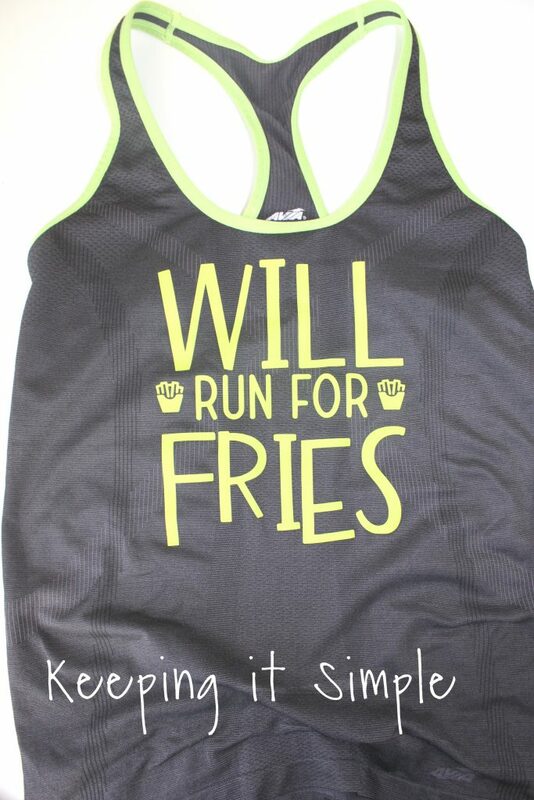 If you love having funny workout tanks, then you have to make yourself some of these! They are just so much fun! 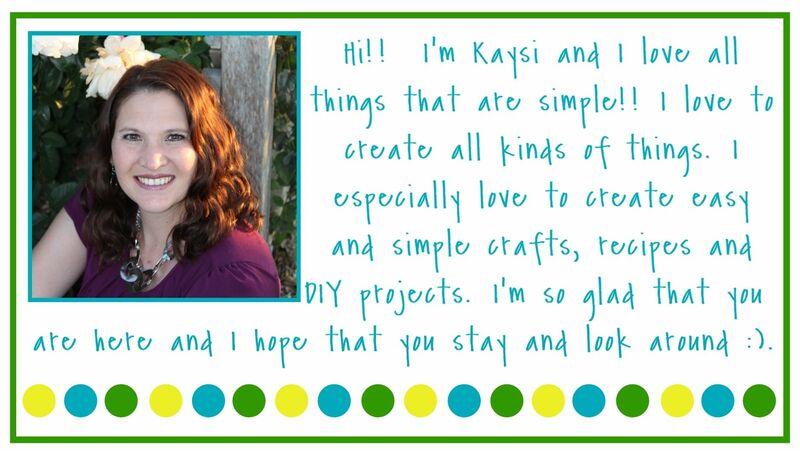 And with the heat press and Silhouette CAMEO, they are super easy to make! 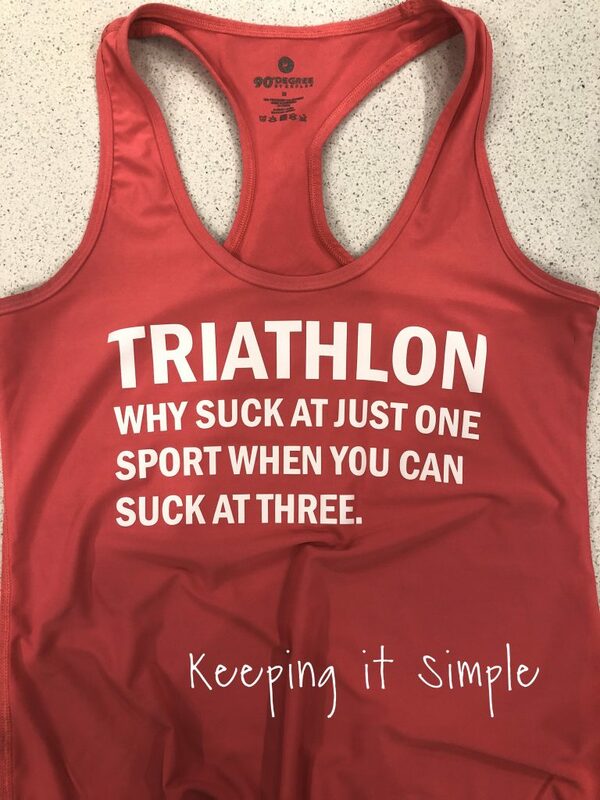 You can use an iron to put the heat transfer on too, just make sure you put enough pressure onto the HTV so that it really seals it into the fabric (when you see the fibers of the fabric through the HTV you know it’s good). Here is a chart with all of the settings for the heat transfer vinyl. 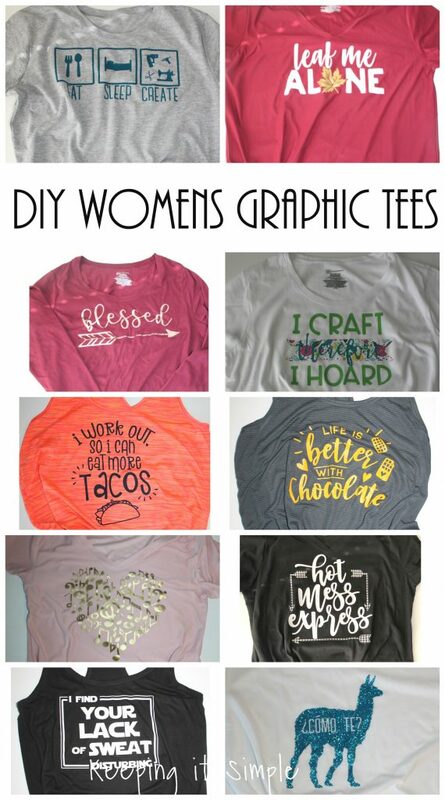 Check out all of my other shirts that I have made.